Lyon–Saint Exupéry Airport (French: Aéroport de Lyon-Saint Exupéry), formerly known as Lyon Satolas Airport (IATA: LYS, ICAO: LFLL), is the international airport of Lyon, an important transport facility for the entire Auvergne-Rhône-Alpes region. It lies in Colombier-Saugnieu, 11 nautical miles (20 km; 13 mi) southeast of Lyon's city centre. The new Rhone Express train now runs between the airport and Part Dieu station in the western part of Lyon city in 30 mins. Route: Lyon Airport station - Meyzieu Z.I. Timings: Trains run every 15 mins 0600-2100. Travel Time: To Part Dieu ~29 mins. Gare de la Part-Dieu (English: Part-Dieu railway station) is the primary railway station in Lyon. 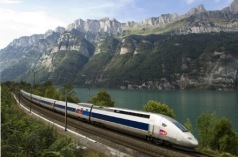 It is situated on the Paris-Lyon-Marseille railway. The train services are operated by SNCF, and Eurostar.